The electrical resistivity, or specific resistance, ρ, is the resistance between the opposite faces of a metre cube of a material. The reciprocal of the electrical resistivity is the electrical conductivity. Values are affected by impurities. Values given in different sources vary considerably. Those given here are an average if there is no great consensus. Resistivity is temperature dependent. See the references for values at other temperatures. In some cases, resistivity depends upon in which direction along a single crystal the measurement is made. Image showing periodicity of the chemical elements for electrical resistivity in a periodic table cityscape style. 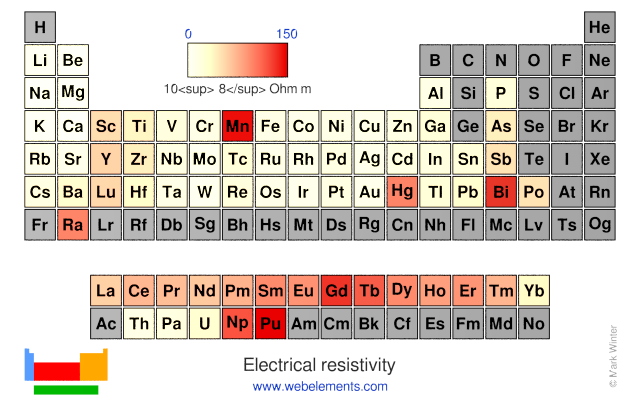 Image showing periodicity of the chemical elements for electrical resistivity in a periodic table heatscape style. 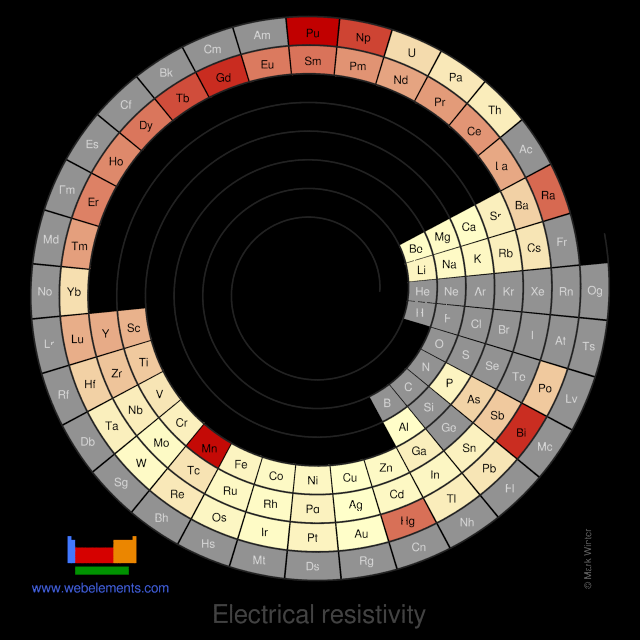 Image showing periodicity of the chemical elements for electrical resistivity in a spiral periodic table heatscape style. 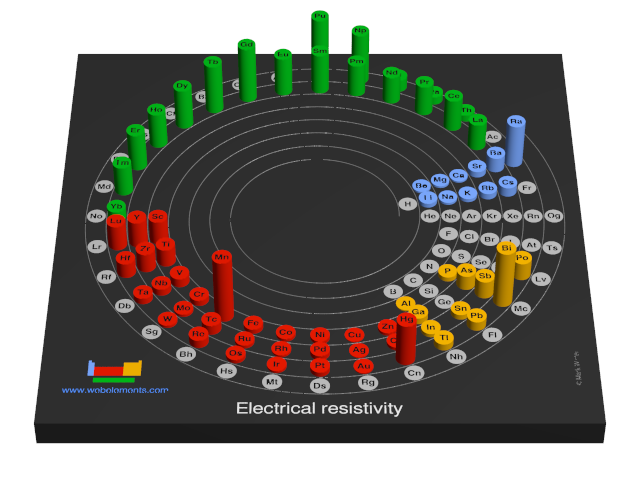 Image showing periodicity of the chemical elements for electrical resistivity in a 3D spiral periodic table column style. 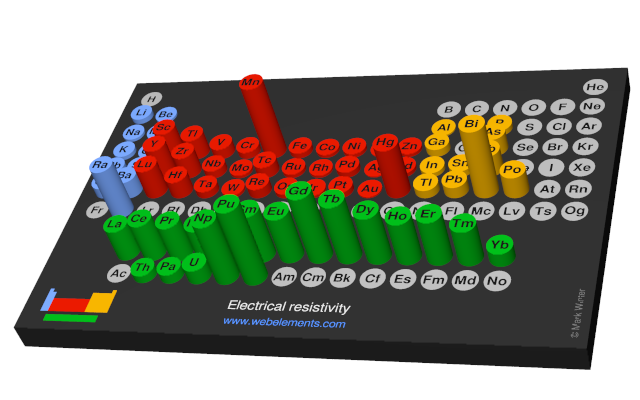 Image showing periodicity of the chemical elements for electrical resistivity in a 3D periodic table column style. Values are quoted at 293-298 K and are given in the SI units of Ohm m. Values are often quoted in micro ohm cm and to convert to these units, multiply by 100 000 000. Most numbers are probably reasonably accurate to 2 significant figures where quoted but it is clear that you should expect values to depend upon your particular sample.